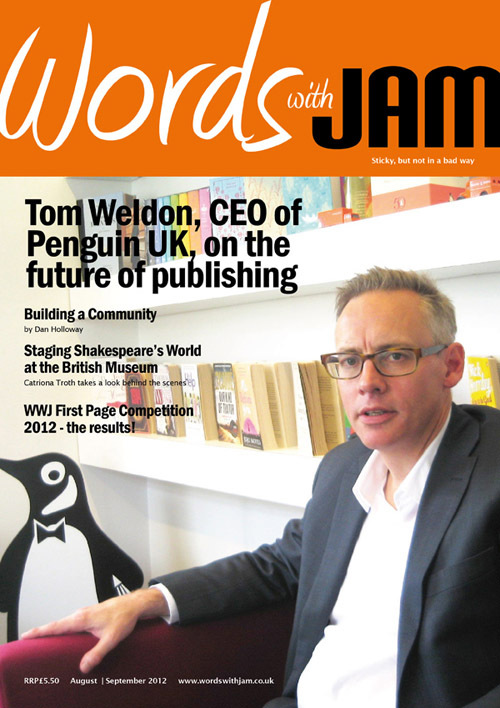 Today's book news reports that Tom Weldon has been appointed as Chief Executive of Penguin Random House UK. Here's an extract from our 2012 August cover interview with the man himself. Congratulations, Tom! 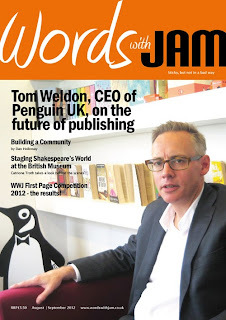 At Penguin’s Head Office on the Strand in London, with a glorious view over the Thames, CEO Tom Weldon took time out of his hectic schedule to talk to JJ Marsh. Can you start by telling us how you got here? What are the qualities you think propelled you to such a position? I’ve worked in publishing for 26 years. I was a trainee at Macmillan and I come from an editorial background, which is unusual as most CEOs come from finance or sales. I also worked at William Heinemann, and now Penguin for the last fifteen years. I’ve been CEO for two years. From my very first moment, I loved publishing. It takes you to so many different worlds through authors and I find that absolutely fascinating. I’m a gambler. In my private life, I’m mad keen on horse-racing, I love casinos. In a way, I think you have to have a gambling instinct in publishing, but you’re betting on something rather more important than horses or cards. What could be more important than books and authors? As for whether I’ve been successful, I’d say that as well as a gambling instinct, I’m also very curious. I care passionately about books; everybody at Penguin does. I’ve also been very lucky. I’ve only ever had two bosses in my career and they’ve both been remarkable women. Philippa Harrison, and in particular, Helen Fraser who taught me not only how to publish, but how to manage people. What do you see as the chief impact of the scrapping of the Net Book Agreement in 1997? It’s brought books to a wider range of people. It opened up the distribution of books, particularly in supermarkets. Of course, there have been some dangers, but overall, it has helped to democratise books. Recently, you said: ‘Our industry is going through more changes now than it has for the past 300 years.’ As a trade publisher, is that exciting or intimidating? (Laughs). Definitely both. I think we’re going through massive structural changes, above all with the growth of online retail and the growth of e-books. That’s putting enormous pressure on bricks-and-mortar bookshops. And also the whole transition from physical to digital. Geographically, we’re becoming more and more one global market. We use this term ‘frenemies’, where our customers can both be our friends and our enemies. We’re increasingly faced by disintermediation; it’s not just other publishers who are our competitors. It could be, for example, gaming companies in the children’s area. So there are many threats. But it’s also incredibly exciting. There are positive benefits from this. I think the appetite for reading will never, ever go away. It’s incredibly resilient. 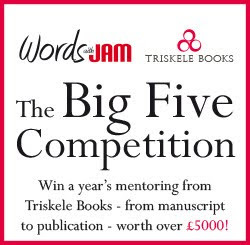 What’s exciting is that we can bring great writers to a wider audience. There are constraints, but storytellers can now use different media to tell their stories. Flexible, adaptive channels can and will be hugely successful. So that’s the situation now. 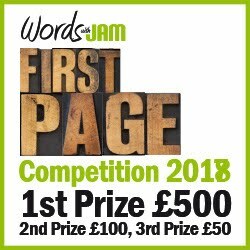 This issue of Words with JAM looks at the future. Management Today quoted you as saying, ‘There are obvious icebergs ahead’. Which are the biggest? The pressure on paper books. There’s a perception in publishing, or paranoia even, that physical books will disappear. I don’t think that’s the case because books are objects people want to own. They are beautiful, and I’m not just talking about coffee table accessories. However, margins on physical books are incredibly thin. 25% of the UK market is now e-books and that could tilt the balance. Worldwide, ten million square feet of bookseller space has been lost in the last year. The downward pressure on pricing is bad news for everyone, and worst of all for authors. Regarding the digital transition, 15% of Penguin UK’s market is e-books. The production department can produce both e-book and paper, enhanced e-books and apps. We’re developing new skill-sets. We have a data insight hub to share with our authors. We’re publishing our authors on multiple platforms. We’re a consumer-facing brand and want to move our marketing model from display to discovery. Working with venturethree, we’re finding ways of helping consumers discover our books. Just a few examples, through pop-up shops, branding of e-books, the use of idents and using Penguin’s own social media, which has 2.5 million users, as channels of communication. Our brand is a crucial tool, as is our ambition and imagination. So surely that must change the staff profile. Anthony Forbes Watson (Pan Macmillan) said, ‘Publishing will migrate from an industry for arts graduates who can count into science graduates who can write a paragraph’. I gather you have another view. (Laughs). There’s always been this misperception of publishing, you know, it’s full of arts graduates. That’s not so. We’ve always needed marketers, sales specialists and so on. New skills we’re trying to cultivate include data management and online communication, children’s specialists, and looking beyond books to consumer products. We’re recruiting diverse individuals to reflect our community. Do you see a greater likelihood of partnerships, such as your collaboration with Mind Candy to bring out the Moshi Monsters books and apps? Or the Razorbill/beActive event? We’re very proud of these collaborations, as we’re always hunting for great creative talent. In fact, in our search for digital storytellers, we’re interested in developing our own IP. This is the Genesis project? Will you expand on that? Of course. It’s about authors. Authors are the heart of what we do. Let’s be realistic; they pay our wages. Especially as authors are marginalised in today’s market. We’ve created an incubator – a small team of creatives – in the children’s area to generate stories, brands, identities and interactive websites. It’s still early days, but we’re enthusiastic about the potential. How do you feel about the expression ‘dead tree books’? Paper as opposed to digital. Me too. And apparently it’s a misnomer anyway. Yes, I’m so covetous of those. You said you’re a gambler. Regarding publishing and the future, where would you place your bets? On authors and books. On storytelling in all its various forms. Publishers who embrace change are the ones who will thrive. Tastemakers and curators need to be dynamic, flexible and fearless, and to listen to readers. I’m always open to new ideas, but with every kind of book, I’m betting on the very best writers. The format may change but it’s still the content that counts. JJ Marsh is the author of The Beatrice Stubbs series, reader, Triskelite, journalist, Nuancer, reviewer and blogger. Likes: pugs, Werner Herzog and anchovies. Dislikes: meat, chocolate and institutionalised sexism.